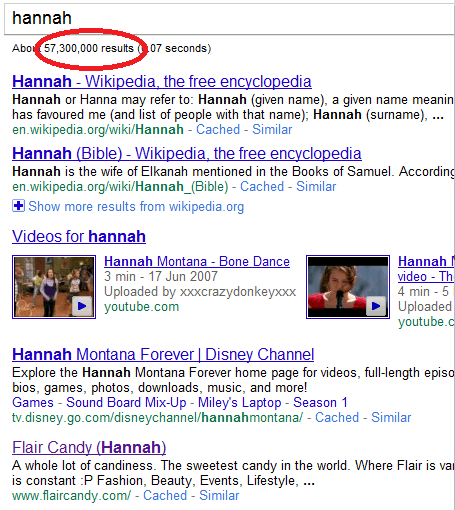 Someone was searching for the word â€œhannahâ€ online and it landed on my site. 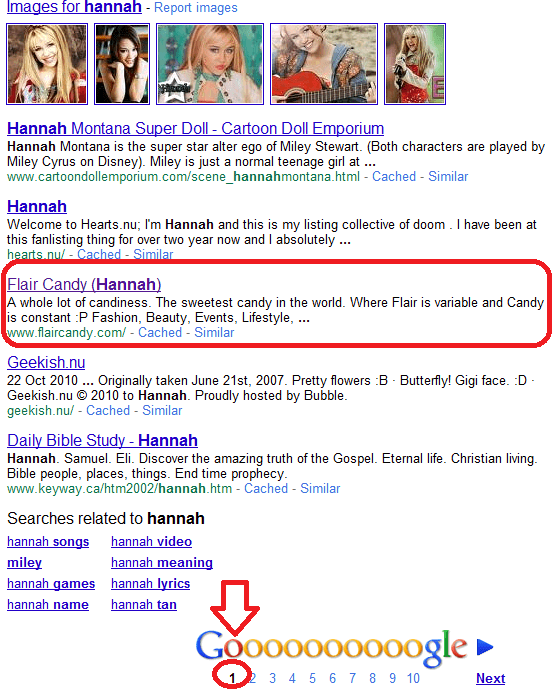 If you search for â€œHannahâ€ on Google.com, my blog will come out in Page 2 canâ€™t complainâ€¦ STILL! I just want to thank you guys for always dropping by my site I love all the mails Iâ€™ve gotten from you. Thanks to friends and family who support me in this cyber world I am in. Try to Google (or Yahoo or Bing) your name tooâ€¦ or if you donâ€™t want thatâ€¦ Google your crushes not the ex-es! stalker mode! Congratulations! It’s really hard to get on those search engines organically. I read a bit on how to do it through “cheating” and that seems really complicated. So this is a real accomplishment! I kind of tried that, too. Googling “Jakey Junkie” got my personal blog on the first result, which is cool for people who’s looking for my blog (I guess there are, as my SiteMeter says). I also tried “Pinoy Kontrabida” too. And…. Hi Hannah! I just googled my name (with surname) and was surprised to find 2 images of me on the first page. It made me actually smile and happy. Though, my namesake who is an obstetrician/gynecologist from abroad took the first page entirely. The only item on that page that pertains to me is my facebook page. This was a nice exercise, though. Thanks! Hi Hannah! Reading this post, got me thinking why the hell havent I tried googling my name before. So I did, using my real full name, which all the while I believed was mine and only mine, given its uniqueness. But lo and behold, search results pull up a Brazilian classical guitarist (popular one at that), and results about me (FB account shows up only on te 2nd page. Anyway, thanks for the idea although, im not too excited bout the fact that I am not the only “ONE”. Cheers! Congratulations! Being in the first list of search in Google makes a difference. Good for you. A lot of websites and people even pay a lot just to be included in the first page results of Google. Wishing more success to you and your great site. astig matry nga yung akin. Hi Hannah! I would like to invite you to join My Regency Blog Giveaway. Thanks for searing your lovely blog! wow hannah congrats astig! 🙂 am not surprised, ang daming pwedeng basahin dito e, aside from Hannah Montana stuff!